Orders for Honda’s best-seller are about to go into orbit – as the radical 10th generation Civic arrives in showrooms next month. The latest incarnation of the popular family hatchback is new from the ground up and comes with dynamic sporting styling, making it one of the best looking new cars I have seen in a long time. The newcomer is longer, lower and wider than its predecessor and has a lower centre of gravity to improve road holding. The tall, rounded shape of the ninth generation has been replaced by a car which is sleek, more dynamic and is far more engaging to drive. At launch Honda is offering a choice of just two engines, both petrol and both turbocharged – a 1.0-litre and a 1.5-litre. Both are available in three different spec levels with prices for the smaller engine model starting from £18,335 and for the 1.5-litre from £22,470. There will be no diesel model until nearer the end of the year and there are no plans to introduce a new estate or Tourer version. The new car will secure the future of the 3,700 workforce at Honda UK’s plant at Swindon where all the new Civics will be built, although it’s Japanese designers who can take credit for the jaw dropping new look. But it’s not all about looks. This new Civic comes with a host of new features too, including much improved leg room for rear seat passengers to stretch out, more luggage space and an innovative new type of luggage-hiding roller blind cover which retracts sideways to alleviate the need for a cumbersome support bar. Sampling the new car my first drive was in the 1.0-litre, which is available with a choice of either six-speed manual gearbox or as a CVT automatic. Most manufacturers are now offering smaller engined cars with three-cylinders so it’s no surprise that Honda has joined the club. But in this case the Swindon plant has produced a cracker of a small engine which punches well above its weight. Despite its diminutive size it manages to produce 129 bhp which propels the manual gearbox version from 0-62 miles per hour in just 10.9 seconds and on to a top speed of 124mph, while at the same time just sipping petrol to average almost 59 miles per gallon. This free revving little unit ensures lively, sporting performance with a rasping exhaust note to match. I always felt that I was travelling faster than I was with this engine but it’s so responsive it’s a thrill a minute to drive. And while some CVT gearboxes can be sedate the one in this Honda is anything but. If it’s even more power you’re looking for, however, you might have to opt for the 182bhp, 1.5-litre engine which propels the car from 0-62 mph in just 8.2 seconds and on to a top speed of 137mph. It has a far more conventional feel to it than the buzzy little three cylinder unit and can definitely throw you back in your seat, although there will be a Civic Type R version around soon to do that even more dramatically. The 1.5-litre models in Sport and Sport Plus have a distinct Type-R look about them, however, thanks to their 17-inch black alloy wheels and large, eye-catching centre set twin exhausts. But if you are more conservative in your taste you can always opt for the Prestige model which boasts upmarket chrome and leather styling. The new car in all its forms is lighter, more rigid and now comes with an all-new multi-link rear suspension. Sadly this has led to Honda having to abandon its innovative “magic seats” which folded up like cinema seats for easy luggage loading. 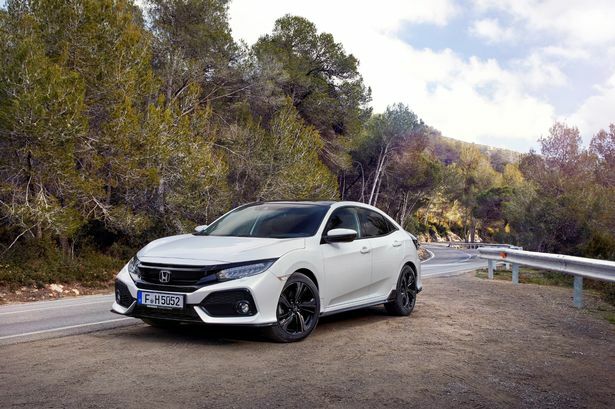 But this new suspension, a new power steering system, more rigidity and a reduction in body weight has made the new Civic one of the best handling new cars around. Get behind the wheel and you will find the car has a really positive feel to it. It flows around corners at high speed with ease and best of all is forgiving when a bend suddenly tightens on you. Civic buyers are a loyal bunch and they are going to love this new version – and so will buyers who have never before been tempted to spend their hard earned cash on a Honda.